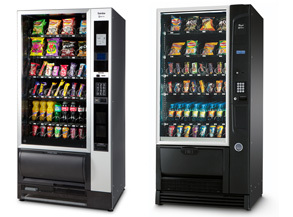 This is the N&W Global Vending full size vendor with similar choices to the Evolution above. 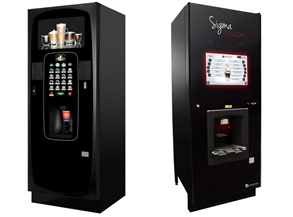 It again offers the full High Street drinks selection and comes in different models with instant drinks, freshbrew drinks and Bean to Cup offerings. A full choice of cold drinks or a simple cold water only selection are available. 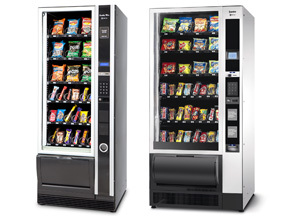 Full size snack merchandisers offering 32 or 40 choices of crisps, confectionery and biscuits from a chilled showcase of products. Crane version is fitted with Surevend a system to ensure your product is dispensed and does not “hang up” in the machine. Version available in a number of planned layouts and configurations. Unchallenged King of food machines the Shopper 2 surpasses it’s forerunner, the Shoppertron, by eliminating the annoying door system with power assisted doors which open with a touch to allow one handed access to the desired product. Crane patented many features on this machine to and it is by far the most popular food vendor in the world today. 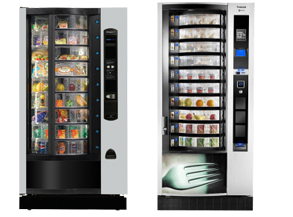 A compact machine style with a range of crisps, Confectionery, biscuits, chilled drinks in cans and bottles. All in one compact machine. We have various models capacities and sizes from leading manufacturers. 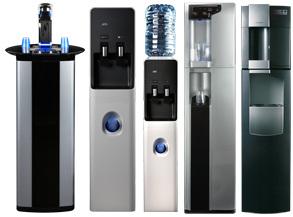 A range of water vending machines both bottle and plumbed. We carry machines by a number of manufacturers to meet the needs of all clients. Filter changes and servicing by our own team plus water carboys and clear plastic or paper cups, regular or conical. Purchase, lease or flexible weekly rentals available. 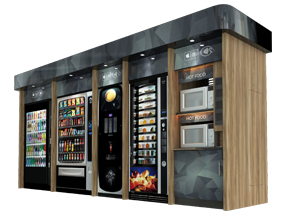 Clients often like to enhance the appearance of an Automatic Canteen area by building in the machines to blend with the decor and perhaps providing added facilities for staff.